Looking back to try to pinpoint when and where my ideas were born, I’m having the hilarious realization that I can’t believe I’ve never noticed before: I am 100% the product of my environment. But aren’t we all? Whether rebelling against or improving upon the ideas and practices we were steeped in as kids, we all contribute to the evolution of the bigger creative picture. I was born and raised in house built in 1901 that my mother converted into a dance studio where she taught ballet. After she passed away, my father turned the studio into a music venue and for nearly 30 years I had a front row seat to some of the most amazing musical experiences I’ve still yet to top. This house had something some kind of magic and everyone who played here or visited could feel it. No one ever told me I needed to try to be a dancer like my mother who had danced with the New York City Ballet; or that I should study Historic Preservation in order to protect old houses like the one I had inherited; or that I should follow in my father’s footsteps and continue hosting music in the house. But that’s exactly what I did. 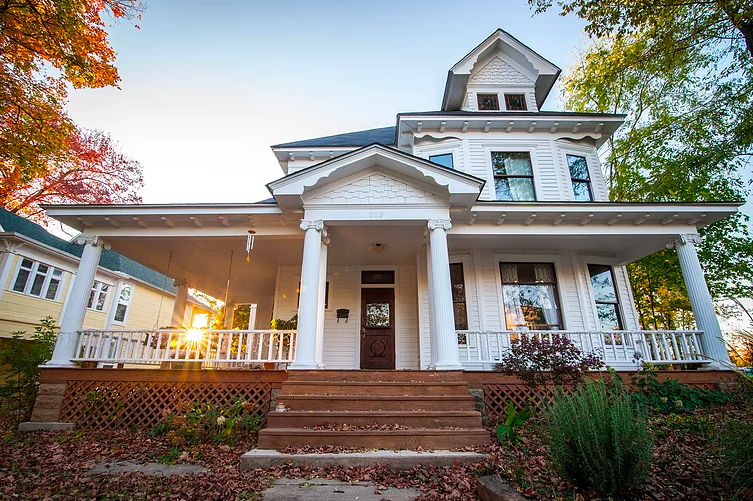 After returning back to Fayetteville, Arkansas, after nearly 10 years away studying and living in different cities, it became very apparent that my ancient home needed some serious love. Like everything else I do, I dove in head first without any real grasp of the magnitude of the project. As rooms were gutted and more and more problems discovered, I kept thinking, “if I had known how hard this was going to be I never would have done it.” But there was no going back. So instead I went forward, and finally almost fours years after I started, the house is complete. There was one room however that I left alone: the cavernous studio space that spans almost the entire first floor of the house. My mother had created it, and my father had repurposed it, and I just couldn’t touch it. I had little flashes of what I wanted for the space over the years. I’d hear studio albums of musicians I’d seen play live at my house and think, “this doesn’t even come close to capturing how amazing this musician is. I wish I could somehow share what I experienced in my home.” Sometimes I’d even whisper my dream out loud to close friends, but inevitably life would keep me from pursuing this idea. After all, I had gone to graduate school and I had a job in my field which was not something to take for granted. I would sit at my desk everyday and dream of creating this space where musicians could stay a while and record their music in a beautiful old house that lends itself so easily to great sound. The main obstacle I faced, and still do, is my own doubt. I was too embarrassed to share my ideas with anyone who knew anything about sound engineering or playing music…because I am not sound engineer, nor a musician and I thought I would be laughed at. Recording studios are traditionally soundproof and high-tech and my house is anything but. After sitting with this dream for six years or so, I finally said it out loud to an actual sound engineer who understood my vision and believed me when I said it’s all I really wanted to do. I knew I wanted to record on tape because the house has such a warm sound already that would translate easily on analog equipment, and that was the extent of my knowledge. Just like the house remodel, I dove in thinking I understood the magnitude of the work needed, but I realize now I haven’t even scratched the surface. I still find myself muttering my old mantra, “If I had known how hard this was going to be I never would have done it.” However, within a few short months the universe lined up and the perfect equipment seemed to magically appear along with the opportunities to record and host live music.